Does Employability Need Emotional Intelligence? It is a fact that the biggest priority of youth work has become the employability of young people. The previous European Youth Strategy proposed initiatives in eight areas, with only one of them being employability and entrepreneurship (the others being social inclusion, participation, education and training, health and well-being, voluntary activities, youth and the world and creativity and culture). The truth that we hear from grass roots youth work is that societies want young people to get a job as soon as possible, and not to stay a long-term financial burden on their parents or the government. We agree that reproduction of the working population is a key to sustainability in the community, and therefore employability of young people should always be one of the highest priorities of youth workers and youth work itself. But the issue of this article is not the aim (employed person), but the path that leads to that aim (learning process), which has not always (if ever) been attuned with the labour market. Youth workers believe that a young person can be employable by developing certain knowledge, but also a certain degree of emotional intelligence. Some might disagree on the usefulness of emotional intelligence for job hunting, but this is not what surveys on the impact of non-formal education in youth organisations and on young people`s employability has shown. 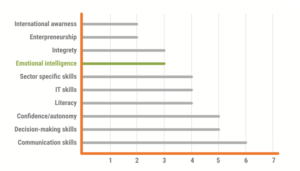 According to eight high-quality large-scale surveys about the skills and competences that employers look for, the following competences/skills or personality traits are demanded when interviewing a person for a new job position. The numbers indicate ranking frequencies of the skills demanded by employers. Three out of eight surveys indicated emotional intelligence as one of the skills that employers are looking for when employing someone new. This indicates that emotional intelligence is a skill or a competence that young people should develop through training or learning. 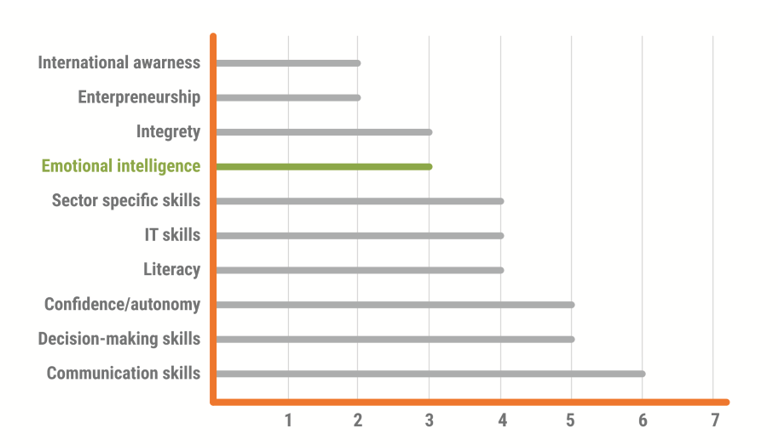 What is also interesting is that ‘sector-specific skills’ only got 4 mentions, while communication and confidence/autonomy, which are a part of the wider definition of emotional intelligence, got 6 and 5 mentions respectively. To some extent then, according to employers, emotional intelligence is expected to be more important for the employability of the young person rather than the skills related to the sector. It has also been shown that employers believe that those individuals that take part in youth organisations’ activities are proactive and have a strong sense of initiative (Bath University, 2010). This survey also indicated that youth work helps young people develop emotional and social skills, such as persistence, motivation and interpersonal skills, which positively influence their academic achievement and attainment of qualifications. Research made about the development of young people’s skills while working in youth organisations can be examined further. Young people (N=1.301) were asked, on a scale from 0 (no improvement) to 5 (high improvement), to estimate how much they believe their involvement in a youth organisation has helped them gain certain skills. The result for emotional intelligence showed an average of 3,55. The same research showed that the development of some skills is stronger and better the more a young person is involved in an organisation, and the longer they are involved in youth work. However skills like integrity, IT, foreign language, emotional intelligence, intercultural skills and literacy/ numeracy were reported to be less sensitive to the level of involvement in youth organisations. These results clearly show that there are benefits from even limited periods of participation in youth organisations, in terms of skills development (Bath University, 2010). In conclusion, local policies should think about the programmes they fund, and youth workers should assess what kind of programmes they develop, in the name of employability of young people. It is obvious that project management trainings do not solve employability by themselves. Youth workers in the future should take a holistic approach to their target group, focusing on mind, body and emotions. 2010 Eurobarometer survey perceptions graduate employability, I-Graduate international employer barometer, QS top MBA jobs and salary trends 2010-11 Wolrdwide; Brunello and Schlotter (2011), Cartwright and Goldstraw (2005), UK`s Learning and Skills Council annual National Employers Skills survey, 2009 UK`s Counsil for Industry and Higher Education survey, 2010 IBM CEO report.